What Lexie Loves: I learned to drive (at 11 years old)! I learned to drive (at 11 years old)! Hola Lexicans! Last weekend I went for a driving lesson. And yes, I know what you're thinking: 'I thought you were 11... How come you're driving?'. 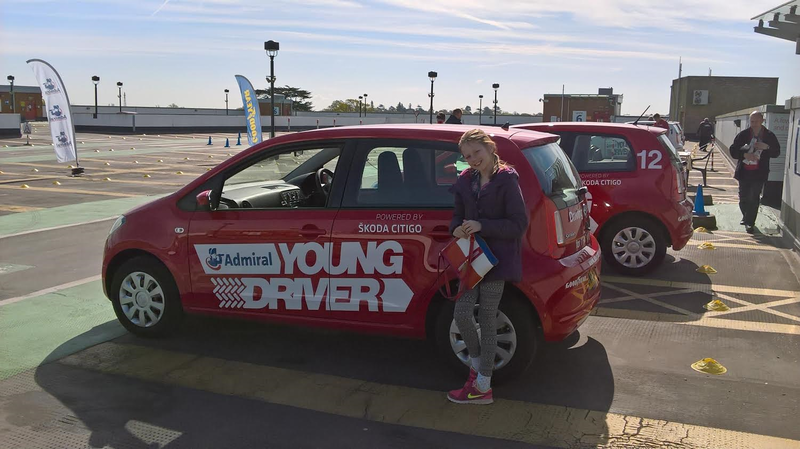 So, today I'm introducing to you - Young Driver, a national company that teach 11+ to drive. Before I went, I had been wondering one key point: What will the cars be like? I sort of imagined that they would just be a more complex version of a go-kart, so when I got to the Young Driver location I was having my lesson in, I was very surprised to see actual cars that you could buy from a shop. The only difference between one you get from the shop and the one I was driving in, is that mine had dual control. Dual control means that the passenger at the front (my instructor) could also brake, accelerate etc. if there was a problem. The actual driving lesson consisted of driving round the course whilst doing little challenges along the way. Once we'd got the car set up we drove round a course that contains Give Way, roundabouts and other things you would find on the road. 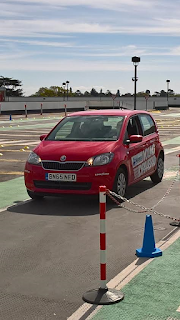 In just one hour, I did slalom, which is going in and out of pillars, like dribbling a ball - but in a car, I learnt how to do a U-turn and could reverse the car safely. I went into the lesson hoping that by the end I would be able to drive a car round a few bends and came out with all this which was amazing. me driving in the car! The instructor I had was called Sara and she was really nice. She explained everything really well in depth, so there was nothing I felt like I couldn't do and if I got confused she would just really patiently go through it again. There were a couple of awkward silences, but we were just concentrating and overall she was really nice. Also, Sara challenged me a bit too which I think is always really important when you're learning something too. Overall, I had a really fun time at Young Driver and would definitely like to go again. 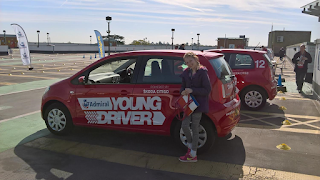 For anyone who has ever liked the idea of driving, I would totally recommend this (ages 11 and upwards at the moment, although they are releasing a younger lesson soon too). They have venues all across the UK too, so there will definitely be one near you (if you live in the UK, of course). Disclaimer: Young Driver gave me a free driving lesson in return for this review. All opinions are my own, and this post is in no way affiliated or sponsored. This seems really cool! But I live in the USA so I couldn't go :( I am glad you got to go though! Wow, this is such an awesome idea! It must've been so, so fun. I would love to participate in this program, except I don't live in the UK! When I read the title I was like "What????!!!!!!!!". That is so cool you could do that! An 11 year old can drive a car whilst here I am...retaking my written driving test after failing. Whoops hahaha! It's such a cool program though, woah!